Solomon Cordwell Buenz recently completed the design for the offices of a global trading firm located in Chicago, Illinois. A global technology-driven trading firm located in downtown Chicago, IMC needed a space that reflected their forward-thinking culture, which emphasizes collaboration and innovation. SCB’s design of the 60,000-square-foot expansion and renovation at Willis Tower supports these principles with a variety of informal meeting spaces for group work with ample writeable surfaces, such as conference room walls, for idea sharing and problem solving. 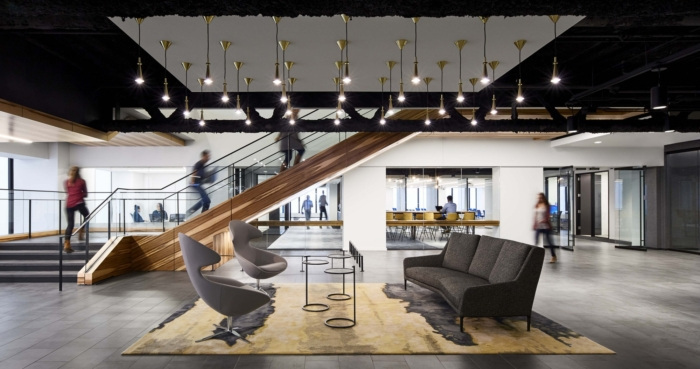 Working within Willis Tower, the design team embraced the structural challenges of the building, incorporating and featuring the columns and large trusses as part of the design. A new staircase connects the two main floors, supporting interaction between the numerous departments within the office. The design also takes a notable approach to support employee wellness. A wellness suite is composed of a mother’s room, prayer/mediation room, massage room, and headache recovery room. Rounding out the suite is a technology-free lounge, which provides a quiet space to unplug and reset.